August has brought us beautiful skies and plenty of sun. 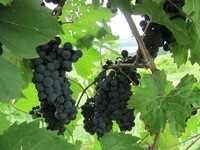 The early ripening varieties like Marechal Foch and Pinot Noir are around 96% full véraison. Later varieties are approximately 40%. 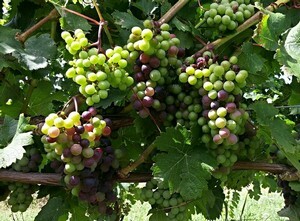 Veraison is a viticulture term meaning "the onset of ripening". 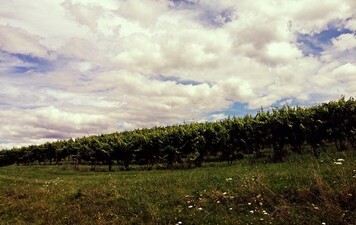 Veraison to the wine industry means, harvest is near! We've completed our second hedging this year. Normally this is only done once but with all the rain we had early in the summer, it was necessary to do for a second time after fruit set. Hedging is literally clipping of the vine tips mechanically and manually when the canopy grows too big. This minimizes the potential for fungus and mildew problems and maximizes sun exposure. Our crew has removed 50% of the leaves in the Cabernet Franc, Cabernet Sauvignon, Pinot Noir, Pinot Gris, Merlot and Gewürztraminer blocks to improve flavor and color, also for air flow. Also in these blocks, we removed the green unripe “Christmas” clusters that developed and secondary shoots. Bird netting was spread out for protection from the voracious Starlings that can decimate our crop. 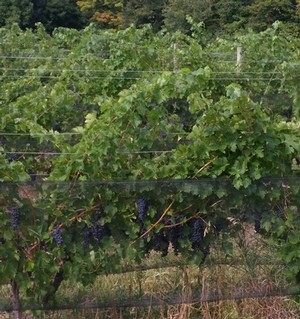 Netted are the Pinot Noir, Cabernet Sauvignon (pictured above) Merlot, Pinot Gris and Blaufränkisch.